As a student, Marcus Baker earned A’s and B’s all his life, but he couldn’t stay out of trouble. He was never violent, but the mischief that started in third grade escalated to suspensions in high school and a respect issue that led to dismissal from Chowan College. On May 16, Baker will become a first-generation college graduate when he walks across the stage at the Old Dominion University Ted Constant Convocation Center. As the student speaker selected for the Tidewater Community College class of 2014, he will share his journey from the projects in Portsmouth to Norfolk State University as a Links scholar. He will transfer there this fall after earning his Associate of Science in Social Sciences from TCC. 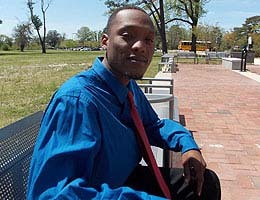 He would like to mentor youth and ideally start a nonprofit that prepares middle schoolers for college. As hard as Baker’s parents tried to remove him from the rough element surrounding him, he couldn’t stay away. When he was 12, a good friend was killed coming home from a party. Instead of that making an impression, Baker continued a path of self-destruction that included an unsuccessful semester at Chowan and a stint in the military that was also short-lived. Meeting his current girlfriend, Chinita Booth, changed his direction. Booth had earned her bachelor’s at Norfolk State, and she didn’t just encourage Baker to start his education at TCC, she arranged it. She filled out the admissions application and turned in his paperwork for financial aid. He even recalls her dropping him off to take his placement tests. “I did well; no remedial classes,” he recalls. The academics didn’t prove difficult for Baker, who carried a 3.7 GPA in high school. But becoming immersed in TCC campus life nurtured him in a way life on the streets never did. When the Portsmouth Campus launched the student ambassador program, Baker was among the first selected. In becoming an advocate for Student African American Brotherhood, he discovered the Student Government Association, where he served first as a senator and then president for the 2013-14 school year. The important people in his life – his parents, Booth, his three children and stepson, his extended family and church family – will be listening to his words and celebrating with him.